Failure to attend will result in benefit sanctions. Join Boycott Workfare‘s campaign against forced-unpaid-labour and sign up to Keep Volunteering Voluntary. Terminally ill people face being forced to work to keep their benefits under draconian new Government plans, it was revealed yesterday. Cancer patients who have more than six months to live could have to do work experience or see their payments slashed under the scheme by Work and Pensions Minister Iain Duncan Smith. And unlike fit and healthy job seekers, there will be no limit on how long those claiming Employment and Support Allowance are expected to work for free. But she later admitted private firms paid by the Government to push people back into work will be able to compel disabled people to take placements or lose money. Mr Duncan Smith’s plan has dismayed experts and fuelled fury over the Government’s “workfare” scheme that forces the jobless to work for their benefits. In an astonishing and genuinely sad day for the trade uni0n movement, the TUC have teamed up with the Confederation of British Industry (CBI) to issue a statement supporting unpaid work. The TUC have sided with the bosses to sing the praises of the Tory Traineeship programme. This unpaid scheme can involve up to five months full-time work, sometimes for giant profit making companies like BT or Virgin. The placements are used to ‘prepare’ young people to be Apprentices, although there is no guarantee that they will be offered even this at the end of the scheme. A computer repair shop in Bristol has become one of the first companies to be caught boasting about forcing people to work without pay on the latest workfare scheme. 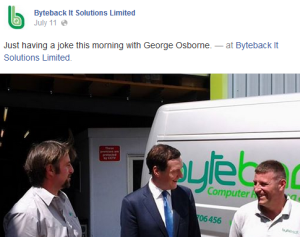 Byteback IT Solutions were recently featured in the Bristol Post after being visited by George Osborne due to their involvement in Community Work Placements. These placements involve six months full time workfare under the threat of benefits being stopped. Statistics released today about the DWP’s Provider Direct destitution causing benefit sanctions hotline, show consistently that Seetec and Ingeus are by far the most vindictive benefit sanctions happy Mandatory Work Activity and Work Programme providers. In a 5 week period Seetec made calls to sanction benefits of nearly 13,000 people (Weeks 18 to 22). In one week alone it called to make 4,417 people destitute (Week 20), compared to 2 by Prospects.